An ugly day of rain and clouds at Gateway Motorsports Park, turned into a beautiful night at the race track. The clouds cleared away, the sun came out and it turned into a perfect evening. Susan and I went over and sat in the stands just before practice got underway. As I usually do when I come to the Midwest, I was on a mission for a breaded pork tenderloin. Fortunately, I found one – and it was mighty tasty. Plus, it was fresh – right out of the fryer. Once I polished that off, the cars fired and the practice got underway. It was a clean hour and a half practice that was interrupted just once, with about nine minutes to go for a track inspection. As the sun went down and the lights became more visible – the cars took a whole new look that they just don’t have in the daytime. Some cars really look spectacular, while others – not so much. There is not much to like about the matte black finish of Charlie Kimball’s car. It looks even worse under the lights. It’s practically invisible because nothing reflects. For whatever reason, the car of Ryan Hunter-Reay’s doesn’t look great at night either. But others look spectacular. The NTT Data car of Ed Jones just popped all night long, as did the car of Takuma Sato. I particularly liked the day-glo yellow cars of Simon Pagenaud and Sébastien Bourdais. They just sparkle under the lights. I followed Bourdais around the track for one lap in the video below. After the sun went completely down, we went under the Turn Four tunnel and back over to the pits. Last year, I watched the race from Pit-In. There’s a video board right there and I could see the cars on the backstretch heading into Turn Three and I could follow them all around to where they came out of Turn Four and onto the main straightaway. Plus, I could practically reach out and touch the cars when they are on Pit Road. Here’s a very short video I shot while standing down there tonight. 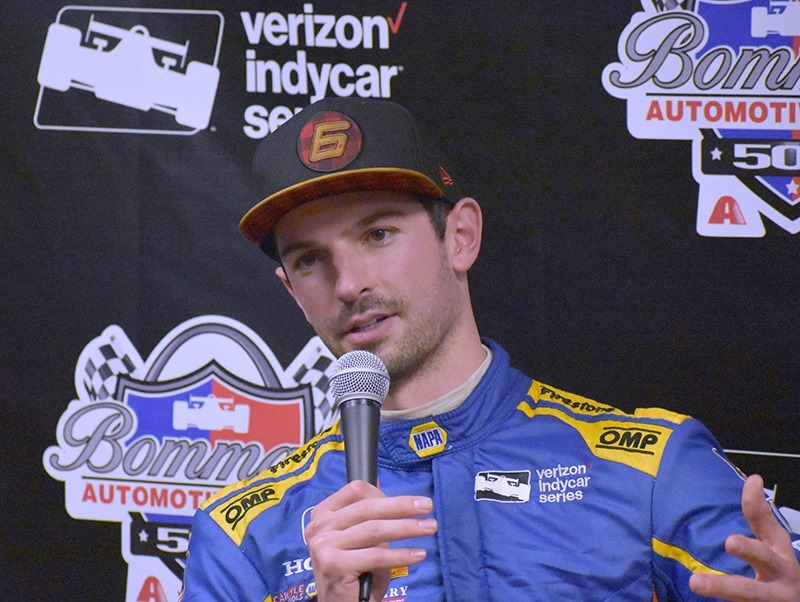 Times were slower tonight than they were this afternoon, but Alexander Rossi still led both sessions. Tonight’s top speed by Rossi was 183.060 mph; 1.3 mph slower than today but still good enough to lead the session. Scott Dixon was just behind Rossi with a best lap speed of 183.022 mph. The surprise of the night was Pietro Fittipaldi, who was third quick with a speed of 182.294 mph. Ed Jones and Zach Veach rounded out the Top-Five. Like this afternoon, Tony Kanaan was the fastest Chevy, with the seventh quickest time of the session. The Penske cars continued to be well off the pace. Will Power was tenth quick, Josef Newgarden had the twelfth quickest time and Simon Pagenaud was buried in fourteenth. The team that dominated this race last year has their work cut out for them Saturday night. 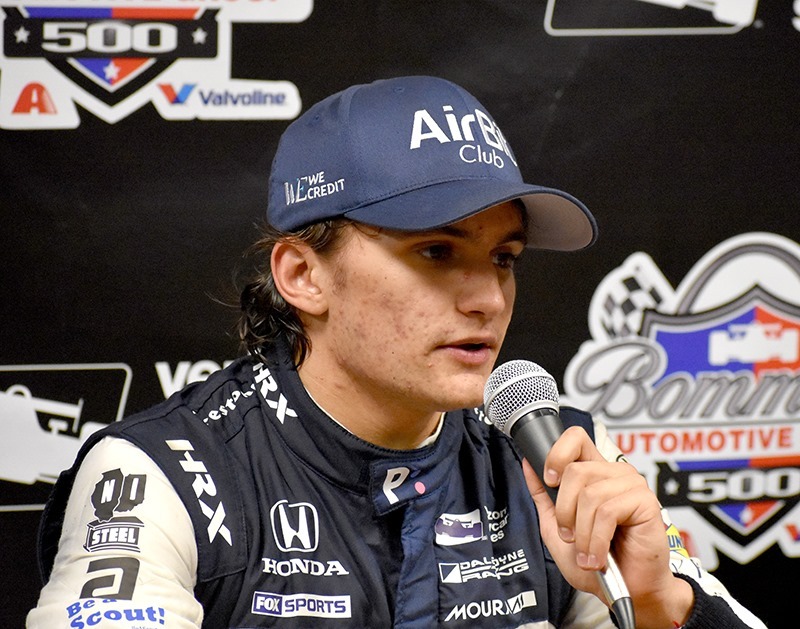 For his outstanding showing, Pietro Fittipaldi was brought into the address the media along with Alexander Rossi. Fittipaldi seemed genuinely eager to be there and discussed his recovery from his injuries suffered at Spa this past April. Rossi discussed the technicalities of this track compared to other ovals. That will do it for us tonight. There is nothing going on in the morning, so it will probably be after lunch before we are on the grounds. There is a vintage IndyCar exhibition at noon CDT and a static display after that. Pro Mazda and Indy Lights race in the late afternoon starting at 3:45 CDT. The pre-race show begins on NBCSN at 7:00 CDT and the green flag flies at around 7:35 CDT – coincidentally the exact same time as the sun sets. It ended up being a very nice evening to be at a race track. I will have a post up here shortly after we arrive, and then Susan will have a post up here before the race. Then I’ll have a wrap-up after the race. Please follow us on Twitter throughout the weekend. You can follow me at @Oilpressureblog and Susan at @MrsOilpressure. Thanks for following along today and please check back tomorrow. 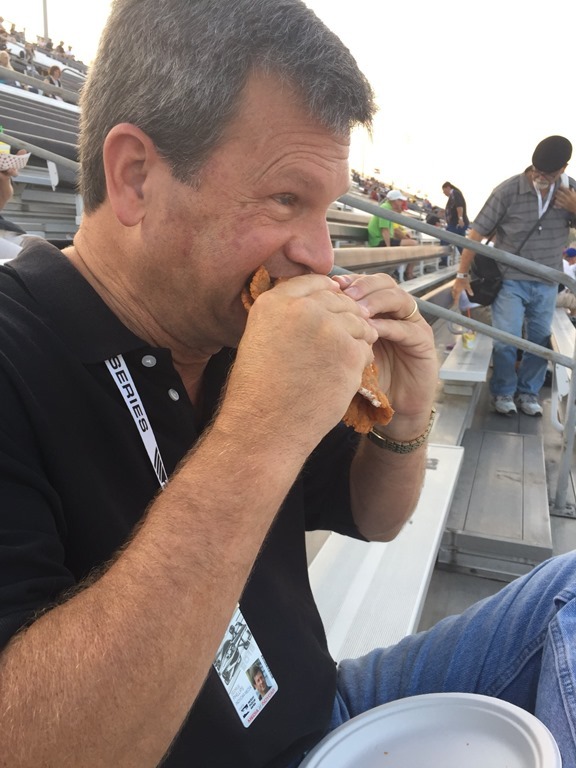 This entry was posted on August 24, 2018 at 10:05 pm and is filed under IndyCar. You can follow any responses to this entry through the RSS 2.0 feed. You can leave a response, or trackback from your own site. What a great vantage point you had at pit entrance! !